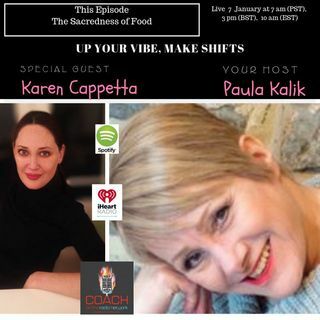 Karen will be talking about the mindfulness surrounding the Sacredness of Food that should go into the preparation and eating of food. This is why she injects so much love into her cookie dough because she wants that love and joy to be transferred to the receiver. How eating healthily can prevent disease and heal. The rise of allergies and other food intolerances as well and how others also need to be compassionate about those who have food allergies and Coeliac Disease. Karen is the founder ... Más informaciones of the UK's 1st 14 allergen free and Vegan Ready Made Cookie Dough Company. She was one of the first pioneers when Gluten Free and Alternative Baking were in their infancy stages. Her cookie dough is an indulgent treat that is healthier and safer for all of those who suffer from Coeliac Disease, other food allergies and those who are Vegan. Karen gives relief to those moms whose kids have food allergies and need to bake every time their child is invited to a playdate or a birthday party for fear of an allergic reaction. It is a very scary place to be for a parent and for the child who always wonders why they can't have “normal” food like other kids. •Gratitude Before Eating and Put Love Into Everything You Prepare and Eat! Contact Karen here karen@angelsandcookies.co.uk with specific dietary requests for bespoke one on one or group classes or birthday parties. Karen’s Favourite Quote is by Dr. Martin Luther King, “Our lives begin to end the day we become silent about things that matter.